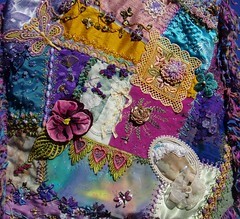 Here is a close-up photo of the front of the bag showing a beaded hand-dyed butterfly motif which was one of first attempts at "painting" the dye onto lace. Sandie gave me some hand-dyed ribbon which I put to good use and she also gave me the little tatted motif and mauve flower at the top, while Mary Lewis sent me the glittery ruffled ribbon in the front. I printed the lady out onto cotton and embellished her, the pansy and diamond shaped motifs were received in swaps and my pride and joy - that mottled piece of fabric at the bottom - silk crepe which I dyed at a dye course I did several years ago. I enjoyed working on the crazy quilting part but I get impatient when it is time to actually put the thing together. Ohh it looks so nice, scrumptious, delicious - I need to make myself one of these! Where do you get your handles from Viv? Viv, what wonderful work you do. Your bag looks really lovely. I too, would like to do one of these. Love all the beautiful work you've done on it...must see it soon.